The focus of their joy and devotion was the completed reconstruction of a site sacred to Shambhala, the enlightened kingdom described in the Kalachakra Tantra. The symbolic complex features 108 stupas and three massive entry portals, all rendered according to the original vision of Mongolia’s renowned 19th c. Buddhist master, Danzan Ravjaa. According to A. Erdenebat, a member of Tavan Dokhio, the organization of those dedicated to the preservation and propagation of Danzan Ravjaa’s spiritual legacy, Danzan Ravjaa (1803-56) was supposed to have lived to age 83. He foresaw that if he lived that long, however, Mongolia’s Manchu overlords would end up assassinating him, massacring his followers, and destroying his lineage forever. So, Erdenebat says, Danzan Ravjaa compressed and channeled the merit of the last 30 years of his life into the building of the Shambhala site. His intention was to offer his followers in future generations the means by which they might take rebirth with him in Shambhala, and take advantage of its uniquely conducive environment for the attainment of final spiritual liberation. The original site, which also included a small temple to enshrine the Kalachakra mandala (Khamariin Khiid’s lamas intend to replicate this temple next year), was completed in 1854, only to be destroyed in 1938 during Mongolia’s religious purges. Under the direction of Z. Altangerel, hundreds of people from across Mongolia and from several other countries contributed an estimated $250,000USD, materials and labor over the past year in a monumental effort to bring about Shambhala’s renaissance. Dozens of lamas led the crowd at dawn in a 3km procession from Khamar’s temples to the gleaming new site. They offered many auspicious prayers, followed by congratulatory speeches and traditional song and dance. Crossing the threshold through the boundary of stupas, the lamas continued prayers and chanting until well into the afternoon. The assembled devotees circumambulated and made offerings at the stupas and ovoos; prayed for the purification of past misdeeds; directed aspirations at Khan Bayan Zurkh Uul, the mountain sacred to one of Danzan Ravjaa’s predecessors, Jamyn Danzan; and admired the bas-relief renderings of Shambhala’s 25 kings and the Kalachakra deity decorating the interior of the gates. The festivities culminated in the evening with an elaborate butter lamp offering ceremony, the singing of Danzan Ravjaa’s spiritual songs, and a fireworks display. 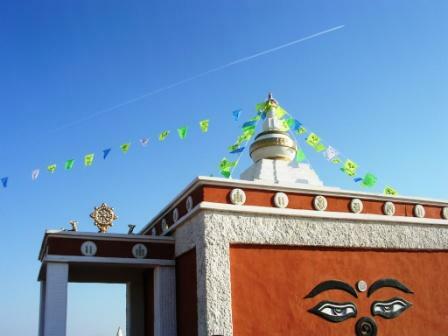 For a more thorough discussion of Shambhala and its connection to Danzan Ravjaa and the Gobi Desert, as well as photos of the progressive building of the sacred site, see Konchog Norbu’s article Shambhala Rising, published by the Tibetan Museum Society. Konchog Norbu is an American Buddhist Monk moving in and out of Mongolia. Get to know him through his blog "Dreaming Of Danzan Ravjaa".